Beef brisket is one of many tough cuts of meat that have been turned into savory specialties by ingenious cooks. In its native state brisket is so ridiculously tough it could easily be mistaken for a dog's chew toy or a piece of an old boot. Yet after long, slow cooking, it is transformed into tender, juicy and richly flavored beef, ready to be sliced or shredded. Shredded brisket sandwiches are usually made with barbecued brisket, but you can use your oven if you don't have a smoker-type barbecue. Score the fat on your brisket with a sharp knife, but don't remove it from the meat. Rub the surfaces thoroughly with a commercial or homemade dry spice rub. These normally include chili powder, onion powder, garlic powder, paprika and various kinds of ground chili peppers. Wrap the brisket and leave it in your refrigerator overnight, so the flavors can begin to penetrate the beef. Preheat your oven the next day to 300 Fahrenheit. Unwrap the brisket and put it in a roasting pan. Place it in the preheated oven. Slow-roast the brisket for four to eight hours, depending on its size and thickness, until it is fork-tender. It will usually reach an internal temperature of 185 to 200 Fahrenheit by the time it's done. Wrap the brisket in aluminum foil and allow it to rest for at least 20 minutes, and preferably one hour, before you begin to cut and shred it. Trim the fat from the surface of your cooked brisket. It may have a triangular muscle, called the "point," attached to the top. If so, cut it off and slice it separately, because the grain of the meat will run in a different direction. Slice the meat across the grain into sections 1 1/2 to 3 inches wide. Use two forks to shred the beef into coarse, stringy chunks. Don't shred it too finely. 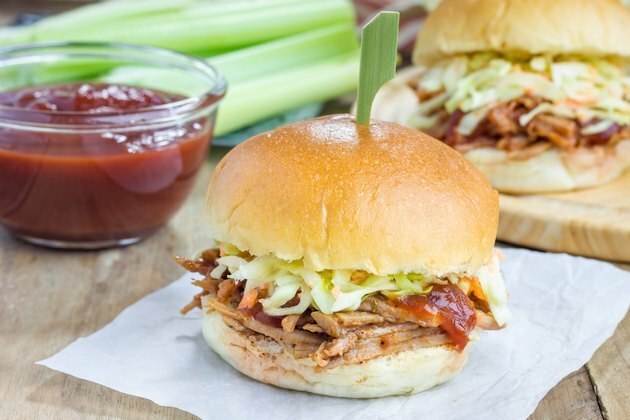 Toss with your favorite barbecue sauce and pile the beef onto soft buns. Brisket can be cooked more quickly, if less authentically, by adding a small amount of water or beef broth to the roasting pan and cooking it under a cover. Traditional barbecued brisket is prepared on a barbecue-style charcoal smoker.